What’s Worse, Teaching on Halloween or the Day After? Good luck to all my fellow teachers out there today. So now that my students are talking like scientists, we are learning to write like scientists too. This year I am really trying to consistently use science notebooks. For the first few days of this unit, we just talked about science and our observations. Once they were comfortable with the sentence frames and vocabulary, we moved onto writing. I conducted an interactive writing lesson with the whole class to model how to take those observations and record them appropriately. I made a giant version of their observation sheets on chart paper and we filled it out together. After we did it altogether, they went off and completed an observation of their own. I gave them the option of using a copy and taping in into their notebooks, or creating that template on their own. The results are varied, but everyone is getting comfortable writing about science which is a VICTORY! I’ll be honest, I got into teaching for 2 reasons. She was/is the coolest teacher on the planet (and in space) and she sparked excitement and curiosity in her students. And her outfits were incredible. Anyway, like the Frizz science is one of my favorite subjects. Unfortunately, it’s usually the 1st subject to get…half-assed. Experiments, models, difficult content, vocab, it’s HARD and time consuming so when corners can be cut, they usually are. 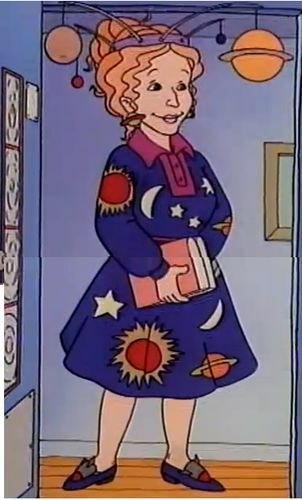 I unfortunately have fallen victim to that too over the years, but this year I am trying my best to channel my inner Frizzle and inspire my students to think and sound like scientists. One way that I am doing this is through the use of sentence frames. I started off using basic ones like “I notice__________” and “I wonder_________” and I am constantly modeling how to use them appropriately. Then I added more complex frames like “I think _____ will happen because ________.”Whenever my students observe something, right now we are growing and observing ecosystems, I prompt them to use the frames to communicate their observations. In addition to the sentence frames, I introduce a new vocabulary word or two with each science session. As I say the word, I pick up or point to the vocab word so they get used to hearing and seeing the word together. As they speak, I make sure they are using the vocab words. I challenge them to use as many of the words as they can to talk about what they notice or what they are wondering. They LOVE this – anything that’s made into a game right?- and as a result we have had some AMAZING science discussions and my students are excited to sound like scientists! Is there anything more difficult and frustrating than trying to get your students to write about their reading?! In my class, I only “make” my kids take notes on the books they are reading with their reading groups. There are two main reasons why we take notes on what we read. So we can have MEANINGFUL discussions about the book with others. I always struggle with the best way to set up student notes. This year my students are using a notebook but I have tried sticky notes, mini-notebooks, typing, and many apps. Some of my students take notes on sticky notes and then add them to their notebook, while others go right to the notebook, but I never know if I should give them a specific amount of notes they have to take, or just let the reactions come naturally. I try to balance writing about reading with ENJOYMENT of reading. Anyway, as a class we have come up with a list of sentence frames that have been a saving grace to my students’ reading notes. It started out with 3 frames, and grew as we learned about new ways to react and reflect on reading. (Type-B alert! Lines not straight or spaced equally! Guess what? It still works.) This list stays up on my literacy board for all to see, however for some kids, I chose 5 or 6 of these and wrote them on a sticky note that stays in their notebooks as a reminder and a reference. I constantly refer to these frames as I talk about books, and am encouraging my students to use it as they communicate about literature. It’s a simple tool that has worked wonders! And teachers, you don’t have to spend hrs using pretty fonts and colors to make an effective tool for your class. I teach 5th grade, which means I need to incorporate a lot of movement into my days. Very rarely are my students sitting at their desks for a long period of time. A few years ago my team wrote a grant and received money to purchase some alternative seating options. We bought several types of chairs and a few standing desks. Since then I have purchased additional seats and I have to be honest, I kind of hate them. I know, I know, flexible seating is the in thing right now and they look really cool. HOWEVER students were constantly fighting over which chair they got to use, there was furniture everywhere, and chairs were breaking left and right. Going into this school year I knew I needed to do something different, so this year I have gotten my desk chairs back, and placed the alternative seating options at various work stations around the room. This eliminates the problem of the chairs being moved around the classroom which makes things safer. Since my kids are allowed to work wherever they are comfortable, they’re still able to use the flexible seating options as they are intended. This table has small yoga balls (being honest- I bought these thinking they were big and was pissed when they came in and were so small). The custodian showed me how to lower the table legs so they could be used safely and this has quickly become a favorite work spot in the room. The accordion chairs at my back table look like something out of a Dr. Seuss book. They have a little wiggle to them but they are pretty sturdy. There are 6 large yoga balls that can be used on the rug. Students switch off using these daily. My students are numbered alphabetically by last name, so we just rotate through which range uses them day to day. Today numbers 7-12 got to use them. In addition to stationing these chairs, I had each student sign a “chair contract”. A part of the contract outlined that students would be responsible for replacing any chair that they damage which has eliminated the problem of broken chairs so far this year. That’s what seating looks like in 5S! As I have said before, I teach 5th grade so I am constantly trying to get my kids up and moving. The math curriculum we have is….kind of boring. The written format for math workshop is essentially- whole class lesson on the rug, then the kids go off and complete workbook pages. It’s just not fun-and kids need to have more fun in math. And let’s be honest, it’s no picnic for me as the teacher either. So, last year I made a pact with my class-at least 2 days a week we don’t do workbook pages. Instead, I pull something from another resource or modify the scheduled lesson in another way. Yes- this does sound time consuming but it’s really not. As a Type-B teacher, I am always pulling things last minute from Pinterest or from someone else. One of my favorite things to do on non-workbook page days is to take the problems from the pages, put them up around the room and have the kids walk around and solve them. Essentially they are just doing the pages but in a fun way that gets them moving around the room. It requires very little work on my part. Sometimes I have them do their work on post-its and stick them to the poster the problem is on, and other times I give them a recording sheet that I collect. To differentiate, I try to throw in a few problems that are simpler, and some that are more challenging. Sometimes I set a timer and tell the class to solve as many as they can in a given amount of time. Other times I tell them to solve at least 3/4 of the problems available. This allows students to pick and choose which problems they try, and puts less pressure on them, making it a bit more fun. ** Anytime you can give kids a “choice” do it! They love having control, and you inevitably are dictating that choice. So if you are looking for a quick and easy way to spice up your math workshops and get your kids up and moving, try this strategy! It has become a routine the last few years of school to start off the year with the Week of Inspirational Math. The WIM was developed by Jo Boaler and her team at Stanford University. Her site, YouCubed has countless open ended math tasks that encourage teamwork, critical thinking, and problem solving. I use her activities quite a bit throughout several units we do in 5th grade. The WIM is made up of 5 lessons, each with a quick video to show the students. Each day there is a central theme including messages such as making mistakes are important, speed it not, visuals and tools help us learn, working with others helps us see things a new way, and confidence is key. The best thing about the WIM is that the lessons are all planned and laid out for you. They are basically idiot proof (for teachers!) which makes it such a good way to start off a busy start to the school year. All of the activities are low floor high ceiling, which means they are approachable to all students. One of my favorite activities is called Four 4’s. In this task, students need to make different equations using ONLY four 4’s to make different numbers. For example 4+4+4+4=16 and 4 x 4 +4 +4= 24. They can use any operation they want, the only rule is they can only use the number 4 and they must use all four. What I love best about this activity is I get to see what operations my students are comfortable with. Some use fractions, some exponents, while some stick to addition and subtraction. Regardless of their level they can each be successful and challenged in their own way. When my students create a new number, they write their equation on a sticky note and add it to a class chart. I keep the chart up in my room all year and when students come to me and say “Mrs. Sullivan I’m done with my work” I can point them in the direction of the Four 4’s board and they have something challenging to work on next. Anchor activities like that keep me sane in my classroom. The Youcubed site is free to join, and there are 3 full Week’s of Inspirational Math currently available on the site. That’s 15 lessons all planned out and ready to go to enrich your math workshops! The lessons are each broken up into grade level ranges to no matter which elementary level you teach, there is a lesson appropriate for you!